Dixie Lawn & Landscaping is comprised of a team of talented individuals. We value integrity, honesty, and understand it takes a team to create a successful business environment. We believe in an open communication policy, allowing for new ideas to be established. We are always seeking to build upon and improve our team. Our ultimate goal is to establish an atmosphere where our employees can flourish. 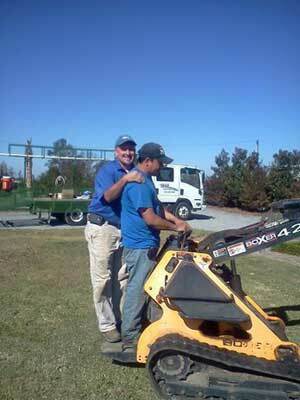 Lawn Maintenance Manager plays a critical role in driving productivity, quality, & safety in Dixie Landscaping’s system. This is a key member of the leadership team. You must have 3-5 years’ experience in a management role. Having knowledge in plant identification, correct maintenance techniques are a must. Being highly self-motivated and enjoying the outdoors is also a must. Building & developing employees and working with employees to build & support a team environment. Managing production for our high quality service through educating & ensuring accountability from each crew leader. Ensuring that customers are completely satisfied through effective communication, relationship building & regular site visits. Dixie Lawn & Landscaping is currently seeking individuals for a mechanic position. This job will require you to have great knowledge with small engines (Kawasaki). Must have great knowledge with 2 cycle equipment. Must know how to trouble shoot problems and repair each issue. The job will also require you to complete preventative maintenance tasks, such as changing oil, cleaning/replacing oil filters & fuel filters, greasing each machine, and cleaning up equipment. There will be minor jobs to the trucks, which include changing oil, changing air filter, fuel filter, changing tires, etc. The candidate must be self-motivated, very organized, and punctual with time. This job will require you to oversee & work alongside our landscape installation crew. You will be managed by our landscape project manager. You need superior judgment & great problem solving skills. Our ideal candidate has 3-5 + years of experience in supervising a crew, reading blueprints & landscape designs. You must have an understanding of plant material, proper planting techniques, hardscape installations, irrigation installations, experience operating landscape related equipment & experience communicating with clients. A passion for landscaping & working outdoors, and capacity to work in extreme weather conditions & lifting/moving heavy objects (up to 50 lbs.) are all important. This is not a training position. * First Name First Name: Required! * Middle Name Middle Name: Required! * Last Name Last Name: Required! * Address (line 1) Address (line 1): Required! * Area Code Phone: Required! Resumé: Required! File Type not supported!